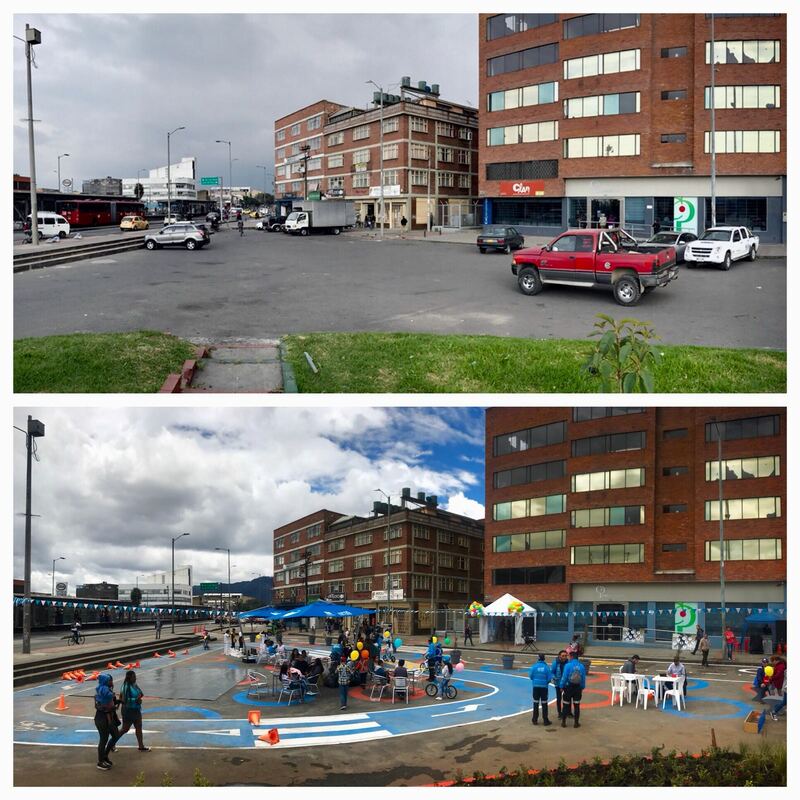 Bogotá recently took another step towards creating safer, sustainable, and more inclusive streets by officially launching the Plazoleta Program which aims to create pedestrian plazas by reclaiming underutilized spaces all over the city. 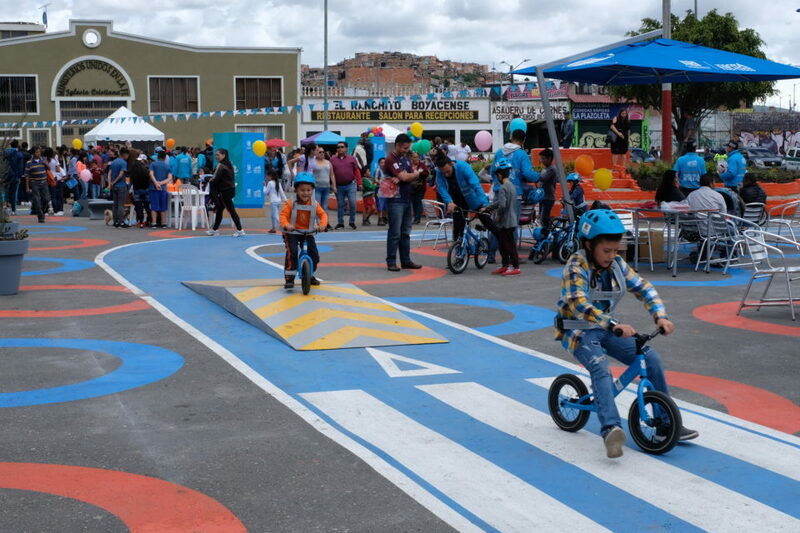 On May 12, 2018 Enrique Peñalosa, mayor of Bogotá, and Janette Sadik-Khan, head of transportation at Bloomberg Associates and chair of NACTO-GDCI, inaugurated the Plazoleta Gustavo Restrepo in the borough of Rafael Uribe-Uribe. The interim transformation reclaimed an underutilized space that has been being used as an informal parking lot and transformed it into a vibrant new public space that includes new public seating, tables and chairs, planters, and a small bike track for children, where they can learn how to bike and basic traffic safety behaviors. In addition to creating a new public space, the intervention addressed a key road safety issue. Prior to transformation, the space was used as a shortcut by drivers looking to avoid a traffic signal, increasing risk and discomfort for the high volume of pedestrians walking in the space to reach the nearby bus rapid transit (TransMilenio) station. 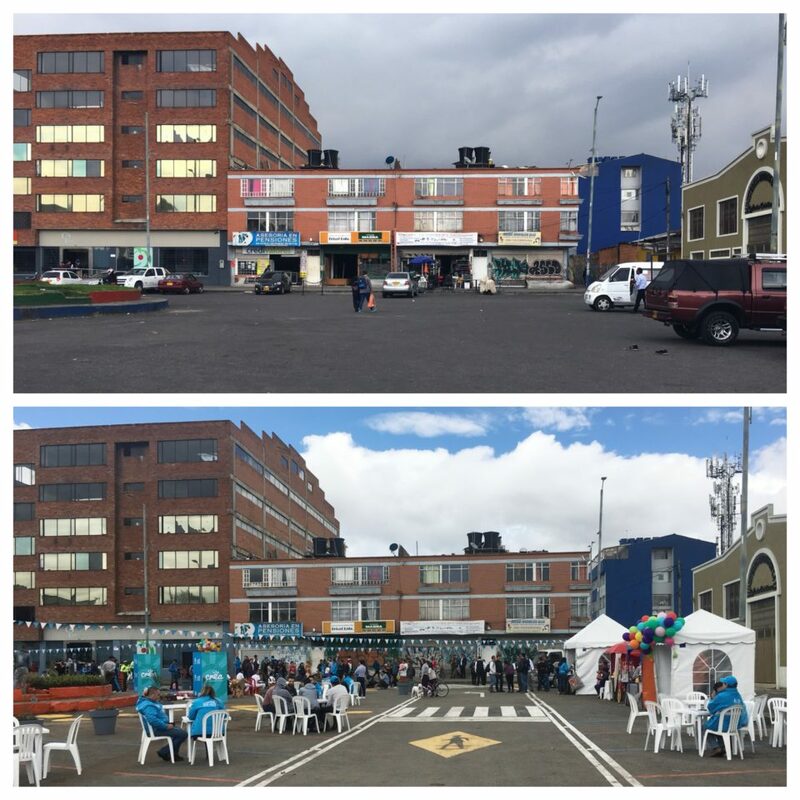 With the opening of Plazoleta Gustavo Restrepo, Mayor Peñalosa officially launched the Plazoleta Program and invited communities and associations to propose spaces to be implemented through an online platform called Bogotá Abierta. The Plazoleta Program was initially started in 2016, when the city tested innovative transformations of underutilized public spaces in the neighborhoods of Nogal (Chapinero), Alqueria (Puente Aranda) and Santa Paula (Usaquén). Bloomberg Associates and NACTO-GDCI have supported local practitioners throughout the process, drafting designs and identifying spaces that create safer streets for pedestrians, cyclists, and transit riders, thanks to generous support from the Bloomberg Initiative for Global Road Safety. The Plazoleta Program aims to convert underutilized spaces into new plazas and public spaces for Bogotanos. The main objective is to enhance the pedestrian environment in Bogotá by improving pedestrian mobility, road safety, and public space quality. The program will follow a three-step implementation process starting with a one-day pop-up event that uses cones and chalk, and allows practitioners to first test the design of the new space. Counts and surveys will be conducted to understand the dynamics, challenges, and opportunities for permanent implementation. In the second phase, an interim solution using low-cost materials will be implemented to create a high-impact design that will remain for several months. The team will continue to involve the community to inform design for capital construction. The interim phase gives the city time to develop and refine the final design. Since September 2016, the city of Bogotá has implemented seven pop-ups, reclaiming over 8,000 sq.m. of space. Three of these went on to become interim plazas covering over 4,000 sq.m. of space in both low- and high-income parts of the city. Plazoletas Bogotá, espacios para todos.